Ha. Funnily enough my father tacked this on to an email I received from him this morning, coming on the heels of my defense of the real-world. I enjoyed this decidedly non-real-world problem and thought you might too. As shown, the area of the square is 1, and the area of the triangle is sqrt(3)/2. 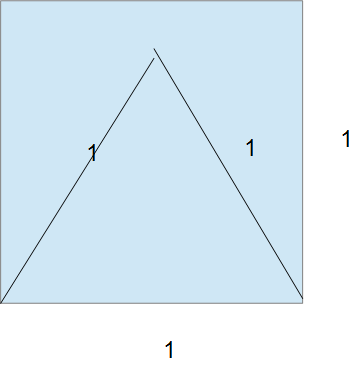 What is the largest equilateral triangle that can be inscribed in the square? I’ve been truly enjoying Dan’s blog post series (from last year!) on the “Fake World.” I’d highly recommend you go read those posts if you haven’t already. It deftly exposes the fallacy of authenticity-as-engagement. I would like to offer a defense (three, really) of applied mathematical tasks. Identify an intriguing scenario and map it to a mathematical standard or concept. Identify a mathematical standard or concept and attempt to come up with an intriguing scenario. The first of those two modes of task development almost necessarily requires a real world experience. I mean, hop over to 101qs.com. These are things that interested teachers mathematically and most of them are, in fact, real things. As for the second mode of task development, when you’re staring at a mathematical standard and attempting to think of how to make it engaging and interesting for kids the very first thing I ask is “in what contexts are this standard applied? What’s a real-world scenario that you can develop a problem around?” It’s the first, easiest in-road to designing a task. 2) Delivering the necessary shock to the system. My own experience necessitated that I get some sort of EMP shock that scrambled my circuits. You see, I was kind of getting in to my groove as a teacher after about 5 years or so. I was beginning to recycle lecture notes and assuredly improve them. Then our entire school (or rather, our academy within the school) began doing Project Based Learning, which does mandate that you employ authentic tasks. While I’ve discussed some of the mediocre and ill-spent time I implemented while struggling with PBL, the most important thing it did was force me to start from scratch. I was forced to actually try to make meaning of the chapters I had been teaching for years. That’s huge. Many of those reading this, Dan’s and other blogs have probably already gone through that experience or something like it. Or maybe many they were already awesome teachers to begin with who started out at the tender age of 22 and was fully bought in to having students solve non-routine complex tasks straightaway. But I wasn’t there, and I’d bet that a vast majority of math teachers working today aren’t terribly familiar with designing high quality tasks from scratch. Let’s be honest and pat ourselves on the back a bit: folks who are so invested in their practice that they’re reading and writing blog posts and interacting on twitter after hours – these are your honors kids. The real world may be more engaging to teachers than it even is to students at the outset. My point is that your theory of engagement might be limiting you. It might be leading you towards boring real-world tasks and away from engaging fake-world tasks. Again, no argument here. But most math teachers are, in fact, giving fake, boring instruction and will continue to do so unless something breaks the cycle. For me, it was a fanatical devotion of my school to developing real-world projects. For many of the teachers I’ve had the opportunity to work with, PBL was similarly their “Road to Damascus” moment as well. Now that I’ve had years to look back and reflect on the mediocre projects I implemented I can happily develop and employ non-authentic tasks. 3) It’s a good thing if students experience math in hands-on, novel, and concrete ways once in a while. To be clear, there’s nothing wrong with beautiful, abstract math for math’s sake. Bryan Meyer’s session on Mathematical Play was phenomenal (and potentially just as earth shattering to his audience as a session on real-world math would have been to me 10 years ago). But there’s something to be said for students experiencing authentic scenarios, researching real-world topics, presenting findings to panels of experts in a professional manner, and so forth. It would be kind of a bummer if a kid left a math class without having experienced some of that. Also, by dismissing the “real-world” as a lever to engagement, you’re giving teachers a kind of out. I’ve had conversations with sanctimonious math teachers and district instructional coaches that cite Paul Lockhart as a reason to keep doing what they’re doing. I’ve read Lockhart. I love Lockhart. But his books aren’t about instructional practice. While much of “Measurement”, say, can and should be handed over to students to explore, it’s frustrating to kids who have only experienced math in the abstract. I don’t know that 100% of tasks should smack of authenticity, but it should be more than 0%. I don’t have other specific blog posts to cite, but I’d suggest there is a general muted backlash against authentic tasks swimming around twitter these days. Not that there’s anything wrong with that. I love the conversations, iron-sharpening-iron and all of that. Dan’s visible thinking on the subject has really challenged and inspired me to reconsider theory of engagement. Consider these defenses a backlash to the backlash. A unifying theory of these three defenses of the real word might be “first steps”. When designing a task from standards, the first, easiest, and sometimes best tasks can be started by asking “where in the real world does this apply?”. When eradicating your old, often-ineffectual instructional modes, the real world is a good place to begin building yourself back up. And finally, when students experience math in authentic situations for the first time, it may be the first connection the student makes with an until-now boring subject. Feel free to let me have it in the comments. Update (3/2/2014): Michael attacks real-worldliness from a modeling perspective. Which is great, because I initially few actual pedagogical reasons for utilizing real world, or even fake real world tasks.